A celebration of the Society of Authors’ Tom-Gallon Award will be held on Saturday 16 May at the Darlington Arts Festival. My story, ‘The Pledge,’ will be read, by a Liars’ League actor, alongside other recent winning stories by Carys Davies, Benjamin Myers and Samuel Wright. The Tom-Gallon Award is an annual award for £1,000 financed by a bequest made by Miss Nellie Tom-Gallon in memory of her brother. It was first awarded in 1943; originally biennial, it is now awarded annually thanks to the support of the ALCS. 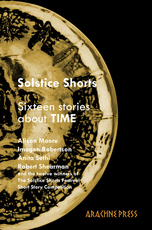 Solstice Shorts: sixteen stories about time is now available to buy here. takahe 83 is now available to buy here.